There are so many ways to make drawers that a book would be the right medium for a comprehensive discussion of the topic. 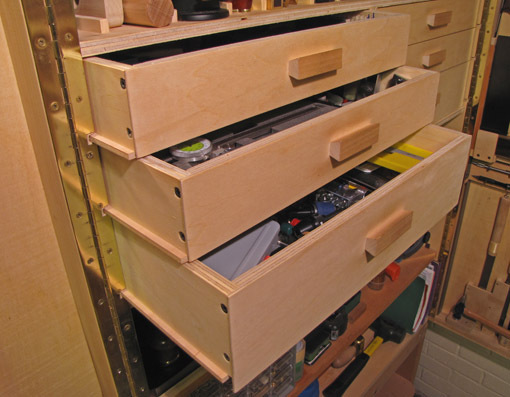 This introduction begins a series of posts, not likely to be contiguous, which will focus on one method for high quality, fairly small size drawers suited for a craftsman’s best projects. Sometimes I wonder why we woodworkers bother with the niceties of fine drawers. I still warmly remember the hectic weeks with a newborn baby in a new house when I stole any minutes I could to build a large tool cabinet for my new shop. Six drawers, nothing too pretty: rabbeted plywood, bottoms running side-hung in dadoes, glue, screws, and feeling tired but happy. Now more than two decades, college expenses, and a lot of woodworking later, they still run smoothly. It would be nice if everything worked this well. Nonetheless, at the other end of the aesthetic spectrum it is certainly possible to combine function with beauty. A logical process, with special attention paid to the critical junctures, will produce enduring, exquisite drawers. This series is based on traditional methods, but I will feature some modifications that I use because they make sense. This is not the only way to make fancy drawers, nor do I propose it as the “best” way because that judgement depends on function and aesthetics which are ultimately the provinces of each craftsman for each project. For making high-end drawers, as with almost all of my woodworking, I employ machines and hand tools, though the latter predominate and certainly are used for the precision steps. 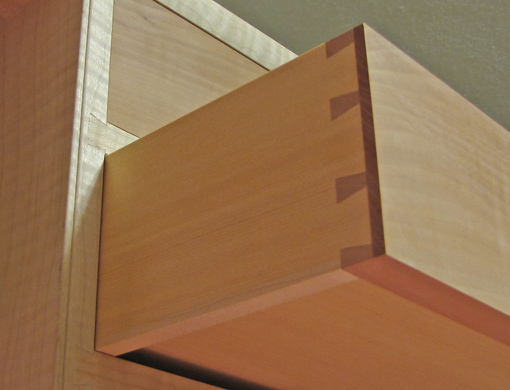 The next post in the series will address the fine points of case construction with regard to drawer fitting. My problem it that my drawers have such a perfect piston fit that the air pressure between the back of the draw and the back of the carcase can makes it difficult to close the drawers. What should I do? I find trimming with a chainsaw works well. But seriously, that air pressure standard is one thing I will address in this series – I think it’s a nonsensical standard of excellence and I’ll explain in a future post. I’m looking forward to this series on drawers. In my childhood home I was fortunate to grow up around a lot of nice “country”, as opposed to high-style, pieces made in the 19th century in New England. I have a few of them now. I loved to open the drawers as a kid and smell the old wood. On the chests of drawers they were mostly lipped fronts, on the small bedside and occasional tables they were flush. In all cases I believe that the drawermaking methods were not those of the English makers who produce piston fitting drawers by sizing each piece individually and gradually bringing them to a perfect fit. By the time I encountered these drawers, they were obviously well used and there was a generous amount of “slop” from friction and wear, but they all function fine. Because of this standard and sensibility, my own early drawer making never went for such tight fits as I hear and read about from contempoary English makers, but the aesthetic appeals to me and I’ll try my hand at it. I just got a DVD from David Savage’s shop on “How to make the piston fit drawer” which details the methodology quite well. Your writing will enhance the subject, no doubt. I recently discovered your blog and really enjoy it. I’m particularly interested in the tool cabinet above. Do you have other pictures you could post? Plans? It looks nice and I’m looking for a good design. Thanks for the comment. Sure sounds like you’ve got woodworking in your blood. Much of the methodology I’ll be discussing is from the English makers, exemplified by Alan Peters, Ian Kirby, and David Charlesworth, but I have incorporated modifications that I believe make sense and facilitate the process. Thanks for your interest. You know, writing this blog if funny. There are things that I would never guess are good topics because I’ve been doing or using them for so long that I don’t imagine they would be of novel interest. However, comments such as yours are helpful to bring up such topics. So I’ll write about the tool cabinet in a future post. If you’re planning to build your cabinet soon, I can move that post up the priority list. Let me know if you want.